The second volume of World War II letters is finally available for purchase on Amazon. Titled Lots of Love, Daddy, this book covers the letters written by Roscoe and Gladys during the fall of 1942. Roscoe was a recent arrival in New Caledonia while Gladys recovered from the birth of David in Kentland, Indiana. Autographed copies of the books can be purchased through the contact form on the website. Payment may be made through PayPal. Stay tuned for more details on this service. 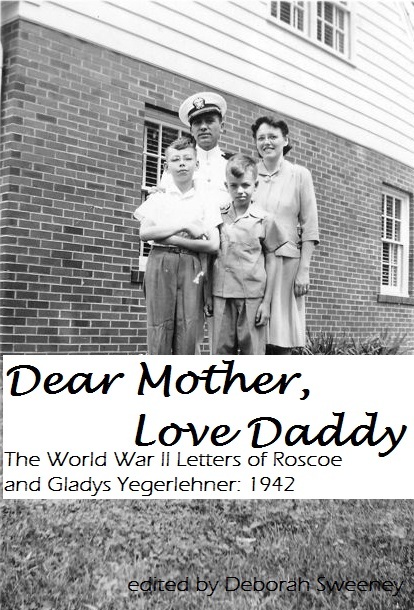 This entry was posted in Lots of Love Daddy, World War II, World War II Letters, Yegerlehner and tagged Gladys R. (Foster) Yegerlehner, Lots of Love Daddy, Roscoe S. Yegerlehner, Self publishing, writing on September 28, 2016 by Deborah Sweeney. Book Update – Book Giveaway! The book will officially be published on March 3rd so I am counting down the days until it’s release. Now that the proof has arrived I have to go over it to make sure the manuscript printed correctly. I’ve already noticed that some of my page numbers are not the right font. I’ve noticed a couple errors on the cover and have submitted those to my cover artist. 2. Leave a comment on the Event page. You can say hi, or you can tell me why you think you should get a free, autographed copy of the book. On March 3rd, I will chose three random people to win an autographed copy of the book. I will announce the winners throughout the day on March 3rd! Disclosure: It will take a few weeks for your copy to arrive so be patient! 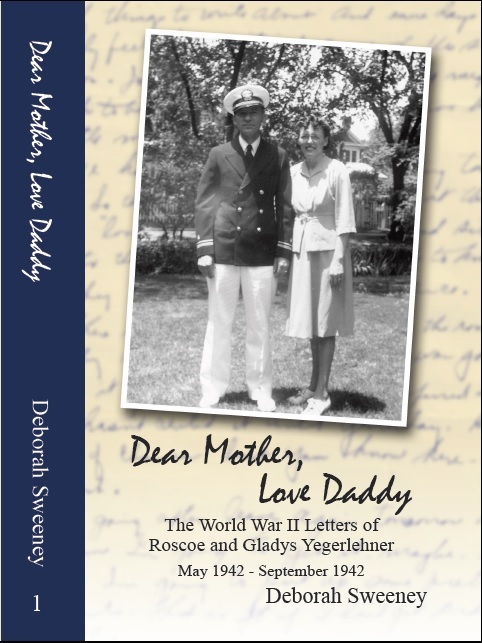 This entry was posted in Dear Mother Love Daddy and tagged books, Foster, genealogy, Self publishing, World War II, World War II letters, writing, Yegerlehner on February 19, 2015 by Deborah Sweeney. Yesterday was the big day! It happened! My first book was finally published. 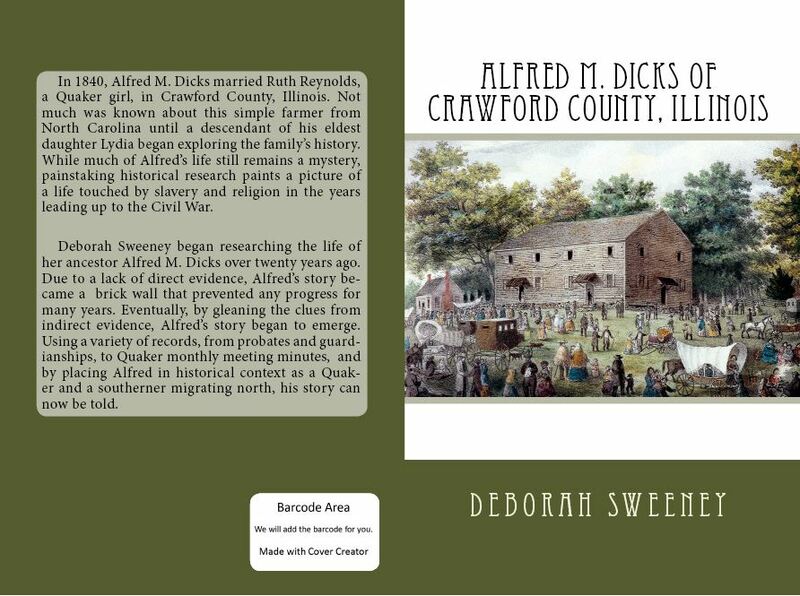 Titled Alfred M. Dicks of Crawford County, Illinois, this book is a genealogical study of one of my ancestors, from Gladys’ side of the family. The manuscript began as a proof argument for my ProGen Study group. Over the years, I have found little direct evidence of Alfred’s parentage, but I have uncovered lots of indirect evidence. So I finally put all the little bits of evidence together, and here it is! This spring I am hoping to repeat the process with the first volume of letters written by Roscoe and Gladys from 1942. I have several relatives who would rather read the letters in book form, instead of on the blog. In comparison, the WWII letters book will be a much larger volume with lots more details for me to “get right.” The first volume with contain over 300 letters. I only have about three more months until I finish the ProGen program. My last major project is a kinship-determination report. I’ve already started organizing my family files in preparation for this project. This time I will be writing about one of Roscoe’s ancestors, Michael Schiele. This entry was posted in Genealogy and tagged Alfred M. Dicks, kinship-determination project, Michael Schiele, Self publishing, writing process on December 13, 2014 by Deborah Sweeney. It has been two weeks since my last progress report, and sadly, I have very little to report. I haven’t been able to do a thing on the book. Work and family have taken every spare minute. Oh, and my ProGen assignment for September and October has expended every other remaining moment of time. I have to write a proof argument; the first draft is due September 25th. Knowing that I am very busy at work this month, I tried to get a head start on this assignment. I spent a good portion of the three day Labor Day weekend working on the proof argument. I am fairly excited about writing this proof argument. Genealogical writing is an area where I would like to focus my genealogy work in the next couple of years. I chose one ancestor who has been rather elusive in the direct evidence department so I think he is a good candidate to write about. After I submit the assignment this month, my ProGen Study group mates will edit and critique it. I then get to rewrite the report for October and submit it for a second round of evaluation. I have also enlisted the aid of my co-worker to do some additional editing. I am hoping to publish the report at the end of October/early November. I may even try to use CreateSpace’s ebook publishing software and directly market my work on Amazon. 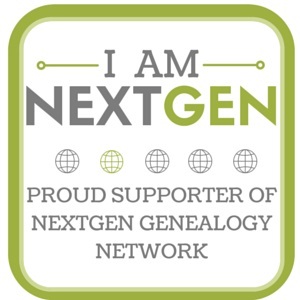 When it comes to my eventual goal of becoming a certified genealogist, I want to have several published works on my resume. One absolutely, amazing genealogical thing finally happened this week. I received my grandfather’s World War II Naval military file from the National Archives. Because he served in the Navy, his records were not burned in the big fire in the 1970s which destroyed most of the Army’s service records. The process took about five months from my initial request to having the documents in hand. I am not my grandfather’s next of kin; I had to enlist my father’s aid in acquiring the file. Since it has been less than 72 years since Roscoe retired from the Navy, his records are not available to the public. There must be at least 100+ pages in his file, and the envelope I received was easily an inch and a half thick. The file gives me additional background documentation for the book. 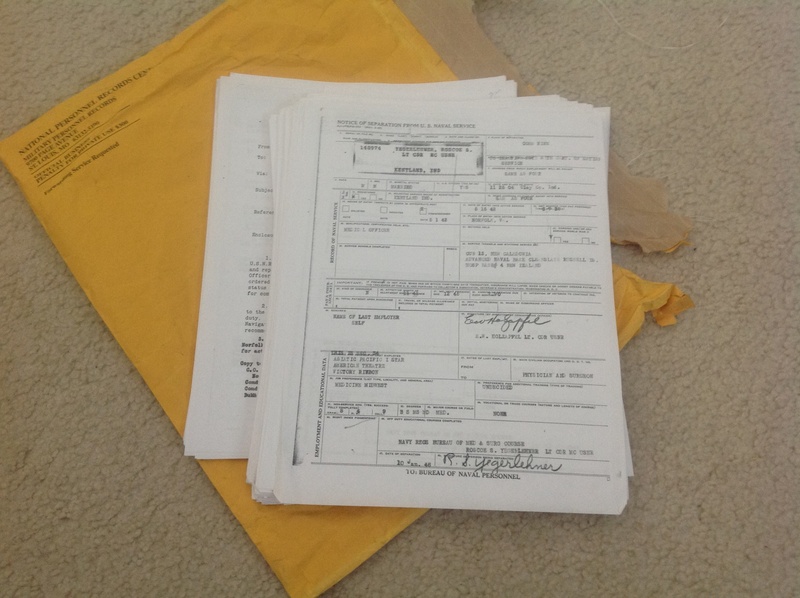 Many of the documents in the file are copies of originals that I already possess. Roscoe and Gladys (surprise, surprise!) kept copies of all of Roscoe’s orders and military paperwork. There are some documents in the file that are new to me, including: character references from people in Kentland when Roscoe made his original application in 1942; a copy of his county birth certificate; reviews by senior officers of Roscoe’s performance; and a copy of Roscoe’s commission. If you ever have the opportunity to find an ancestor’s military file, it is completely worth it. I am fairly tempted to go back and reorder the complete military file for some of my Civil War ancestors. I have purchased several pension files in the past, but never the complete file. 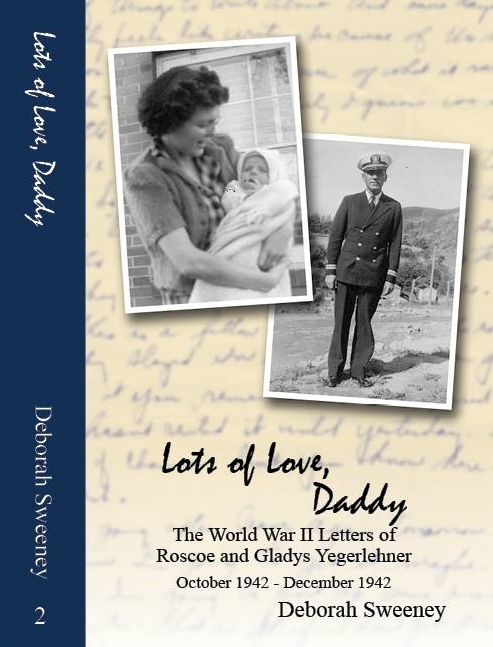 This entry was posted in Genealogy, World War II, Yegerlehner and tagged Book Progress, books, genealogy, National Archives, Personal writing, research, Roscoe S. Yegerlehner, Self publishing, writing process on September 6, 2014 by Deborah Sweeney. This week in book land I feel like have accomplished a lot but I know I still have a small mountain to climb. After reading some more of the tutorials on the book publishing site, I realized I needed to re-format my page size. I had been using a page size of 8 ½ x 11 (in Word), but the actual book pages are going to be 6 x 9. Once I adjusted the page size, my page count jumped from just over 400 pages to almost 800. Yikes! And I hadn’t even finished adding the letters for December or any of the appendixes. At that point, I decreased the font size from 13 point to 12 and the book still was over 700 pages. I went back to the CreateSpace website to try and find any information on suggested font sizes. Most books don’t inform the reader about font type or style so it was really hard for me to judge what size fonts are in a typical book. I finally found a “book template” on CreateSpace which used an 11 point font. I went back through my manuscript again and changed everything to 11 point. The book is now just over 600 pages, and will probably have a finished length of around 650. I finished adding all the letters to the manuscript this week. Yay! I am now in the process of my “first edit.” I am going back through all the letters, checking typos, adding more footnotes, and deciding illustrations (photographs and documents). I am reformatting the letters back to their original indents and removing the page notations, for example “[page 1],” that I had on the blog. I feel that while they may have worked on the blog, in the book they didn’t. The letters flow better. My current plan is to go through this first edit stage and then print off a copy of the whole manuscript. From this copy I will do another round of editing as well as begin to build my index. Although I will have an opportunity to purchase a “proof” copy of the book before it goes on sale, I want to make sure that the book is ready before I upload it. I see a lot of editing in my future. This week, I was back at my regular school site and I twisted the arm of one of my colleagues to be an editor for me. I gave her my first two chapters, the Introduction and Who Were Roscoe and Gladys?. Because she is not overly familiar with the ins and outs of my family, she is a great one for asking questions about things that don’t make sense in my narrative regarding my grandparents. Because I know the story so well, it is sometimes hard to remember that not everyone knows all the details. I’ve also started thinking about who I might want to include in my Acknowledgements page. Many people have encouraged me and supported me over the last (almost) two years. Another major victory for myself this week…I FINALLY got Word to format two different page headers. The left page header has the book title Dear Mother, Love Daddy, while the right page header has the current chapter. I manged to do this while keeping the page numbering intact (at the page bottom) and having no page heading on the first page of the chapter. Of course, I have now probably cursed myself….. This entry was posted in Genealogy, Yegerlehner and tagged books, genealogy, Personal writing, Self publishing, World War II, World War II letters, Yegerlehner on August 16, 2014 by Deborah Sweeney. Since last week I feel like I have done a huge amount of work on the book. I had already been thinking of using CreateSpace, Amazon’s printing company, to publish the book. This is a print on demand service, with sales through Amazon. Eventually, I can format the book for the eBook format. I finished setting up my account last weekend, downloaded the instructional booklet, and started studying. My book is now registered and officially has an ISBN number assigned to it. Things are beginning to feel very real! At this point, it would be great if I could have everything ready for the end of Thanksgiving when the blog celebrates its second anniversary. However, I have to be realistic and look at my heavy work schedule for the next few months. Best case scenario, the book will be ready by Thanksgiving; if not, probably early in 2015. I finally finished organizing the chapter of November letters, and am more than halfway through December’s chapter. After reading the preparing your manuscript guide from CreateSpace, I know that my pictures should already be in the manuscript when I upload it. I have added 12 photographs/documents at this point with many more to go. Any images I use have to be a minimum of 300 dpi. While most of the photographs I have already scanned are at a higher dpi, some of the documents I want to use were scanned at a lower resolution. I am not using any color images so everything also has to be in black/white or grayscale. I ordered a sample book from CreateSpace so I can see and feel what the paper I plan on using is like. It currently has not arrived, but I am anxiously waiting! For size, I have chosen on a 6 x 9 paperbook. This is one of the standard publishing sizes so it gives me more options for advertising the book in outlets besides Amazon. I believe my book will be about the same size and shape as my large paperback editions of the Game of Thrones. I have a feeling that the book is going to be about as thick at this point, too. As of last night, the manuscript numbered 426 pages. I think it might hit 500 before I am done. While doing some preparation of my title page and the reverse side, I did some research on CIP, or Catalogue-in-Publishing information. This data is found on the reverse side of a book’s title page. The data is generated by the Library of Congress and it helps libraries to catalogue their books. It also aids in purchasing so libraries have a general idea of what a book is about before they buy it for their collections. Unfortunately for me, this service is only available for books that are printed by publishing houses. Print on demand and self-publishers are considered too small to warrant inclusion at this time. I had hoped to classify my book under World War II Letters, or Indiana correspondence, which would have aided in my sales marketing. I learned some new formatting tricks this week with Microsoft Word as well. I figured out how to put title headings on every page, but have the first page of the Chapters be different (without a header). I played around with different styles of page numbering so now my title pages and the beginning pages of the book aren’t numbered. The numbering starts at the beginning of the first chapter. If you have never done this before, let me tell you, it was very frustrating to figure out! And of course, rather easy once the trick is mastered. Work on re-writing and expanding the chapter titled Who Were Roscoe and Gladys? Question for readers: Do you think I should spell out words that were abbreviated, specifically if they improve comprehension and readability? Bear in mind I already have a ton of footnotes, so I really don’t want to make the reader look around and lose concentration to find what the word means/is. This entry was posted in Genealogy, World War II, World War II Letters, Yegerlehner and tagged books, Personal writing, Self publishing, World War II, World War II letters, Yegerlehner on August 9, 2014 by Deborah Sweeney.